Brownells launches Retro M16A1-style furniture, available in different colors, including stocks, pistol grips and triangular handguards. Brownells now offers M16A1-style furniture in black, Air Force green and brown. "We're proud to offer these classic-looking parts to help accomplish those builds." Retro rifle fans, rejoice! Brownells announces M16A1-style furniture in 3 different colors, allowing enthusiasts to complete authentic-looking replicas of classic early AR-15 variants. Colors available include black, Air Force contract green, and brown for builds replicating early Eugene Stoner prototypes. Available separately or in complete furniture sets, the early-pattern stocks, pistol grips and iconic triangular handguard sets are made with fully-modern materials, and are attractively priced compared to hard-to-find originals. Handguards fit into triangular handguard caps. Stocks are based on the Type D pattern, without a trapdoor compartment, and fit onto A-1 length buffer tubes. Complete Retro Furniture Set, Black. #078-000-353. $79.99 retail. Retro Stock, Black. #078-000-350. $39.99 retail. Retro Pistol Grip, Black. #078-000-347. #14.99 retail. Complete Retro Furniture Set, Green. #078-000-354. $79.99 retail. Retro Handguard, Green. #078-000-345. $39.99 retail. Retro Stock, Green. #078-000-351. $39.99 retail. Retro Pistol Grip, Green. #078-000-348. $14.99 retail. Retro Handguard, Brown. #078-000-346. $39.99 retail. Retro Stock, Brown. #078-000-352. $39.99 retail. Retro Pistol Grip, Brown. #078-000-349. $14.99 retail. 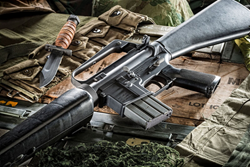 The Retro furniture complements the other Retro M16A1 parts Brownells also offers, including both upper and lower receivers, barrels, bolt carrier groups and other small parts. To see all of Brownells Retro parts, click here.